Play now the brilliant Bar Star that strips back all the distractions of new online slots game to offer an instinctive, casino-style slot where wins can be quickly maximized to build cash prizes. 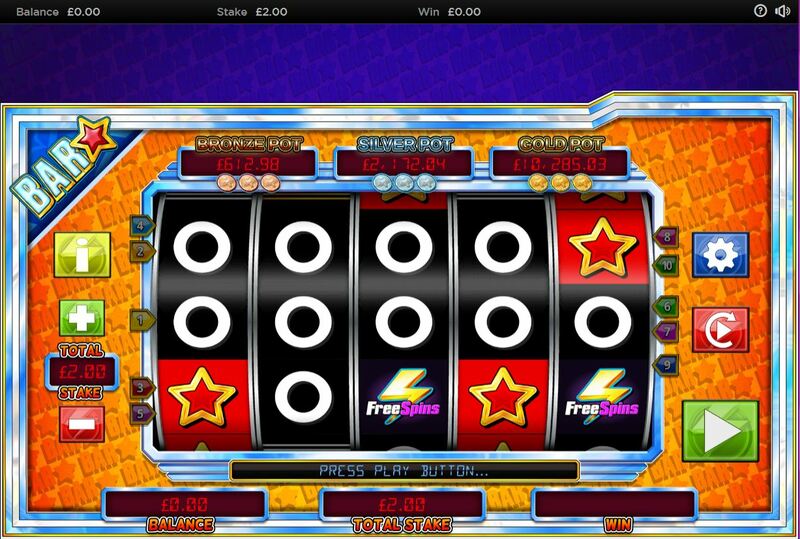 This very playable, easy to learn 5 reel slot with 10 pay lines has the reassuring icons of gold bars to give players maximum reassurance of winning big with a traditional slot game experience that brings the magic of a Las Vegas casino right into the heart of the home, and potential big wins from the very first spin of the reels. 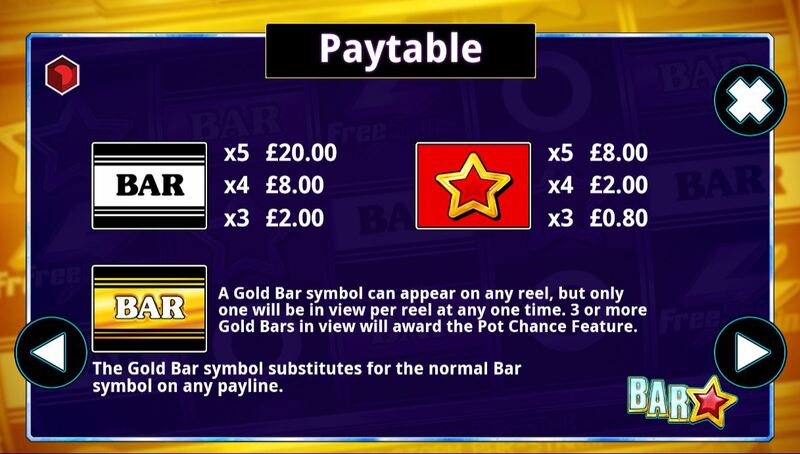 This one pays – from, 3, 4 or 5 matched symbols, the player will get a return for engaging with Bar Star! This isn't the only new jackpot slot game we have from CORE Gaming! If you're looking for promo's, visit Slotsbaby now! Bar Star plays over 5 reels with 10 paylines, and gives gamers a chance to enjoy a classic slot experience from the comfort of their home. A generous number of bonus games enhances the winning possibilities and makes this a game online casino novices or experts alike can have hour of fun learning or trying to master. Free Spins: These are triggered by 3 bonus scatter symbols on any position on the 1st, 3rd , or 5th reel in ordinary game play. When these extraordinary events are triggered, a player can win either 5, 10 or 15 free spins via a pick me scenario. And that’s not all! Additional free spins can be won on top of the ones landed originally, awarding the same amount as the original bonus round! Pot Chance: When activated, Pot Chance gold bars will activate a coin selection game related to three progressive pots, in Gold, Silver and Bronze. Revealing 3 coins the same colour will deposit money into the progressive cash pot. Mixed coins will award a consolation prize. Wilds: A gold bar, when it appears, can appear on any reel but will only appear on any one reel at any one time. 3 or more gold bars in view awards the pot chance feature.